Guts and Glory is an amazing racing game developed by HakJak Productions. 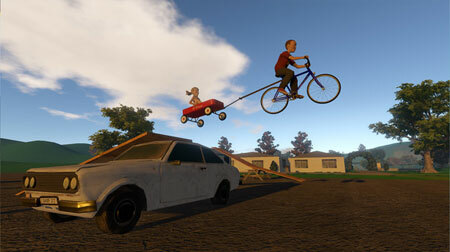 It is about father and son riding their bicycle through obstacle courses of death, and other fun family experiences. Your objective is racing to the finish line while everything tries to kill you. Dodge spinning saw blades, deadly spikes, explosives, turrets, and many other hazards, while navigating insane tracks set in a wide variety of environments. The game features over 70 official tracks by HakJak, over 1000 workshop levels, 8 different physics-driven vehicles with dynamic damage and destruction, over 40 hazards and special items including cannons, explosives, wrecking balls, circular saws, poop cannons and more. If you get stuck in the game, check out the video walkthrough and gameplay for the game. This entry was posted in PC Games, Walkthrough and tagged Guts and Glory Cheats, Guts and Glory Funny Moments, Guts and Glory Game, Guts and Glory Gameplay, Guts and Glory Guide, Guts and Glory Hints, Guts and Glory Review, Guts and Glory Solutions, Guts and Glory Strategy, Guts and Glory Tips, Guts and Glory Walkthrough by Marvin. Bookmark the permalink.